La versión en español de esta entrada será publicada mañana, 31/10. In most countries there are well-defined metrics on the access, use and quality of financial products and services. Fewer assessments are available, however, on how they impact people’s financial well-being. For this reason, CAF–Development Bank of Latin America ─ together with Sebastian Cardenas of the Financial Superintendence of Colombia, Paola Cuadros of the Central Bank of Colombia, and Catalina Estrada of the Universidad de los Andes ─ has worked on a study that provides a first assessment of financial well-being in Latin America, based on the Consumer Financial Protection Bureau’s (CFPB) research and the results of the financial capabilities surveys carried out in seven countries of the region: Argentina, Bolivia, Chile, Colombia, Ecuador, Paraguay, and Peru. In addition, the study evaluates the determinants of financial well-being in each of these countries. The CFPB defines financial well-being as a state of being in which a person can fully meet current and ongoing financial obligations, can feel secure in their financial future and is able to make choices that allow them to enjoy life. 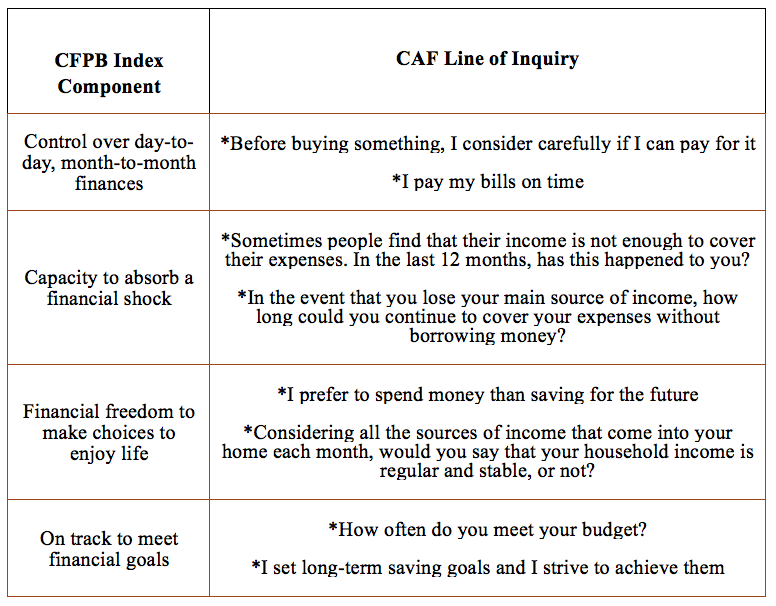 The CAF surveys, in comparison, inquire about people’s financial capabilities, which we define as the combined set of knowledge, skills, attitudes and behaviors in relation to financial issues. Although the formulation of these survey questions is not identical to that of the CFPB, we’ve identified survey questions that best fit the elements of financial well-being as raised by the CFPB. The financial well-being scores proposed in the study measure the ability of people to fully meet current and ongoing financial obligations, feel secure in their financial future and be able to make choices that allow them to enjoy life, according to CFPB’s definition. 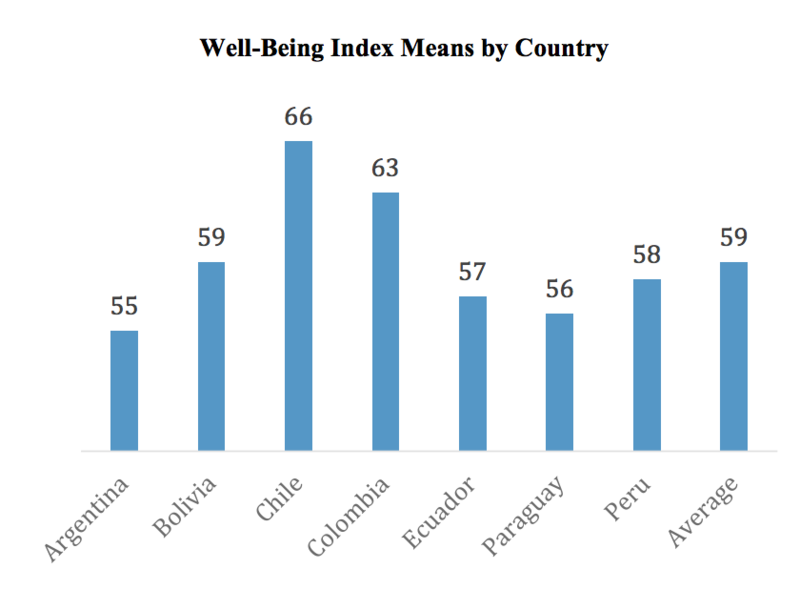 The country analysis shows that top scores were found in Chile (66) and Colombia (63), followed by Bolivia (59) and Peru (58), and lastly Ecuador (57), Paraguay (56) and Argentina (55). These results suggest that Chile and Colombia are faring relatively well in the sub-region conformed by these seven countries. By contrast, Paraguay, Ecuador and Argentina are facing greater financial challenges. We find that this index provides greater insight into financial well-being beyond traditional measures of financial inclusion─that is, even when a person belongs to a group that is relatively disadvantaged (for example, those with lower income and education levels), there may be compensating factors or strategies that offer other opportunities for these individuals to increase their financial well-being, such as savings, planning ahead or being part of safety networks (family, community, etc.). Second, differences in average financial well-being are largely based on savings behavior, rather than borrowing behavior. This suggests that not having or not using formal products to save may be more harmful to one’s financial well-being than not having access to formal credit. Third, individuals with higher levels of financial knowledge and financial skills have greater financial well-being on average. Fourth, there are key variables that help explain an individual’s financial well-being, such as previous experience with the formal financial sector, comparison shopping between financial institutions before acquiring a new financial product, and personal participation or involvement in the financial decisions of the household. Embedding attitudes and behaviors – including saving, comparison shopping between different financial institutions before acquiring a new financial product, and personal participation or involvement in the financial decisions of the household – within financial education and inclusion programs could have a significant impact on individuals’ financial well-being. Financial knowledge is important for financial well-being. Thus, it is imperative that public and private institutions implement programs that effectively promote financial capability through interventions that aim to change behavior with teachable moments, learning by doing, nudges and reminders, heuristics, gamification, personalization, and socialization, according to CFI’s recommendations on financial capability. Ultimately, we believe more research is needed to understand the drivers of financial well-being in order to better design (and implement) financial education and inclusion programs across Latin America.